The Alsina mobile working platform allows working safely at heights. It is mainly used during the pouring and vibrating of concrete. The mobile working platform is self-stable and includes elements that comply with the regulations and reinforce its safety, such as the baseboard, the railing and the intermediate railing. The Alsina mobile working platform is composed by multidirectional elements. 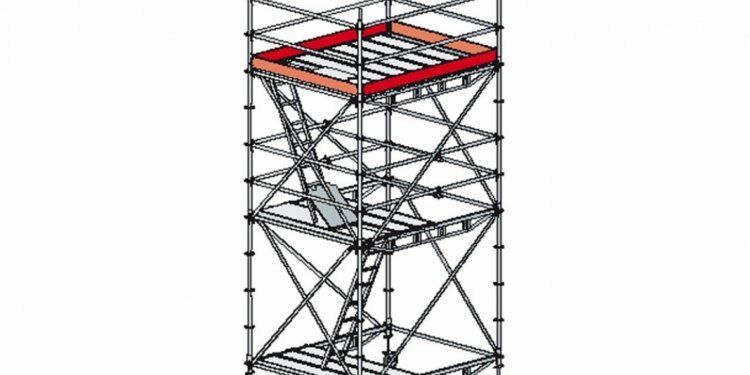 Designed to carry out with total safety the pouring and vibrating of concrete in columns and walls, it also allows making other kind of tasks at height in a safe way. Alsina has mobile working platforms in 9′-10 1/8”, 14′-9 3/16”, 18′-9/16”, 21′-7 13/16” (3 / 4, 5 / 5, 5 and 6, 6 m of height). Recommended use for heights between 8′-2 7/16” and 3 9/16” (2, 5 and 9 m). Manufactured with highly resistant and durable materials (steel and aluminium). Designed and manufactured according to the HD 1004 European Standard. The multidirectional elements allow multiple applications on site.